Sidwell Summer offers a Community Service program that provides hands-on service experience to participants to help build life skills. Campers will work at various sites throughout the week (primarily active outdoor work). Campers will work with their peers and their trip leader on projects and activities. Campers will have a time for quiet reflection to think about or speak on the activities they completed. Community Service Hours: Up to 20 hours, varying based on week/services. All Community Service Program participants must have an immunization record on file with Sidwell Summer before the program begins. Check out our other Community Service opportunity on our Bethesda Campus. Helping Hands: This 1-week workshop provides hands-on community service opportunities. 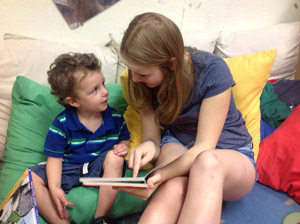 Campers will volunteer at different types of non-profit organizations during the week. Volunteer sites potentially include, but are not limited to: community farms, homeless services providers, parks, and environmental agencies (schedule may vary by week based on availability of agencies). Activities will largely entail outdoor work. Participants should bring a bag lunch daily.